Plain (Flat) sawn hardwood lumber is produced by making the first cut down the center of the log. The half log is mounted with the heart side flat against the flitch table of the slicer. 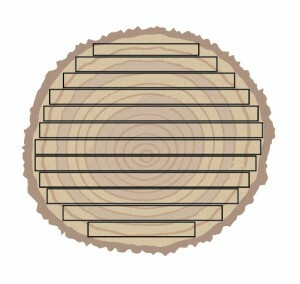 The slicing is done parallel to a line through the center of the log. Plain sawn lumber is the most common and widely used method of sawing it offers a distinct cathedral effect to the grain on the face of the boards. Displays varied grain patterns & the unique “cathedral” appearance. 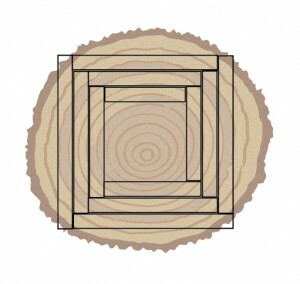 This linear grain pattern is achieved by milling perpendicular to log’s growth rings. 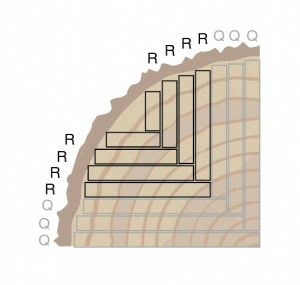 The log is milled on an angle between 45° to 75°. Rift sawn lumber is dimensionally superior to both plain sawn and quarter sawn lumber. However, it also produces the most waste, which will cost more per board foot than either quarter sawn and plain sawn lumber. Ideal for custom furniture makers to use for table, chair, and other straight pieces. The most dimensionally stable cut of lumber available. Unique, linear appearance on both sides of the lumber planks. To mill quarter sawn wood, each log is sawed at a radial angle into four quarters. Then each quarter is plain sawn. This produces a straight, linear grain pattern. This method of quarter sawing does leave some waste, but much less than rift sawn lumber. Reduces shrinking and swelling in hardwood lumber width. Reduces twisting, warping and cupping. Is less prone to surface checking. Has a smooth surface as raised grain is not pronounced. Live sawn lumber is lumber sawn straight through the log from top to bottom. It is characterized by having rift or quartersawn board edges that merge into a flat sawn center. It is often sold unedged. Live sawn is also called “French Cut” where the boards have a return to cathedral grain that runs down the center two-thirds of the board.